Creating habitat in your yard means inviting in predators as well as prey. You can't have healthy equilibrium without creatures at all levels of the food chain. 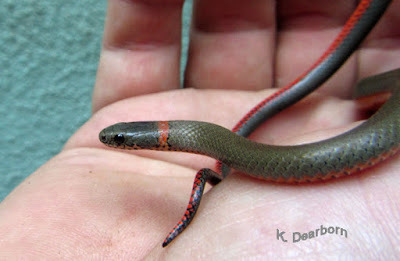 Though small in size (typically 30-90 cm) the ring-necked snake is an important predator of small creatures, notably salamanders and lizards in its western distribution. We have both, especially a growing population of western fence lizards. We noticed a couple of years ago that the explosion of young fence lizards had slowed. Around that time came my first observation of a ring-necked snake. Not long after, I found the remains of one that had been eaten. This snake species is found across North America. The eastern population tends to be smaller with a yellowish belly, while the western population has a bright red belly. In both cases this bright coloration is flashed at would-be predators to scare them off. The color red is often found in nature as a warning color suggesting venom or poison. There are theories that the red scares scrub-jays which might potentially eat these small snakes if they found them in the leaf litter. The ring-necked snake is a member of family colubridae, the most numerous group of snakes. Most are harmless to humans. The large eyes indicate that this snake is a visual hunter and as a colubrid with a long thin, fast body, it most likely tracks down its prey. Lizards and amphibians can be tricky to catch and subdue. The ring-necked snake is one of many colubrids which is now known to have venom delivered by fixed fangs at the back of the mouth. The venom delivery system has evolved for prey like lizards. The snake bites the lizard, holds on and moves the mouth back and forth to work the venom into the struggling prey. The nature of the venom and the manner of its delivery makes most rear-fanged venomous snakes not dangerous to humans. This little snake does not want to use its valuable venom on a human or a bird predator, that is why it has the warning coloration on its belly. "I could bite you scrub-jay, but I really don't want to. Leave me alone." We gently relocated the ring-necked snake to the other side of the yard while we were working on the fence. We hope that it stays and continues to live in our yard. Small, unassuming predators like the ring-necked snake are vital to biodiversity and habitat balance. Would you believe that a study of density, found a healthy ecosystem could have 719 - 1,849 of these small snakes in an area the size of two football fields? And most people would have no idea they were there. Did you get a whiff of its bad body odor after handling the snake?